I stopped wearing my Fitbit. Why? I can't say for sure, but I had become increasingly annoyed with wearing a tracking device 24/7. The more tracking devices that entered the market, the less I wanted to wear mine. I realize this makes no sense; shouldn't I want to track my steps now more than ever because the devices keep improving? Won't having the data and understanding my habits continue to benefit my health? Maybe, maybe not. I was an early adopter of fitness tracking, acquiring the original Fitbit in September 2010. At the time, I was working on the [no longer existing] Google Health product and we integrated Fitbit into our platform. The idea of quantified self was new to me and I was excited to check out the devices and the data. I ran a team challenge at work using our new Fitbits, complete with t-shirts and prizes for the most active people. Even more important than having the data, I found myself changing behaviors to make sure I hit the 10K step goal each day. I took the stairs more, ran more often, and added mid-day walk breaks to my day whenever possible. Many of my friends became my 'friends' on the Fitbit platform, adding extra motivation to hit the goals and to 'beat' others that week. I was hooked. After about a year and a half, I found myself less interested in tracking and hated that I often forgot the Fitbit on my jeans when I went to workout. When my Fitbit charger broke, I didn't have it replaced and decided to forget about tracking for a while. Fast forward to 2013. Fitbit was in v3 on the clip-on trackers and had added the hugely popular Flex wristband. I jumped back on the bandwagon and purchased the Fitbit One, which was definitely an improvement over the original. My favorite part? It counted flights of stairs - a really enjoyable metric after hard trail runs. 389 flights over 10 miles? Awesome. Soon after, activity trackers started appearing out of the woodwork with each company creating its own version. While the new trackers added diversity to the market and choice for consumers, they also spread the users (and my Fitbit friends) more widely across platforms. Over time, many Fitbit friends migrated to other trackers or went inactive, which left me feeling less invested in using the app. I honestly didn't realize how much I cared about the social part of fitness tracking until this began to happen. 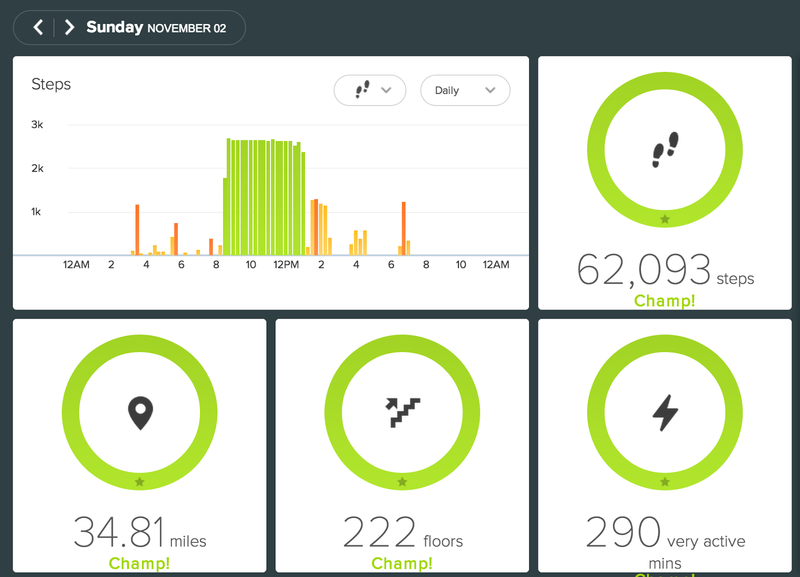 By the time fall 2014 came around, I still liked the overall Fitbit platform and the data it provided but my excitement for tracking every step had disappeared. Some friends had joined or re-activated their Fitbit use, but even that wasn't keeping me invested anymore. Add that to feeling annoyed with wearing the clip, and I found myself wondering why I continued to put it on everyday. So I stopped. Every day since then, my brain has told me to put on the Fitbit, to move it to my running clothes, and to glance at the app to see how many steps I've taken. I didn't realize how much I thought about the Fitbit until I stopped wearing it - I've realized I literally thought about the Fitbit all the time. Isn't it funny how such a little, optional activity tracker can start to rule day-to-day thoughts? That said, I'm happy about the thoughts and behaviors that have become second nature because of this device. I almost always take the stairs to my third floor office, I walk to cafes that are farther away at lunch, and I make sure to get some activity in on non-running days. I'm extremely aware of my daily activity level in a good way. Going forward, I have yet to decide if I'd rather have an open platform tracking device or if I want to be completely free of activity data. Would integrating all fitness tracker brands into one social platform be more engaging? What if a single company could import fitness data from all tracking platforms, allowing users to interact regardless of which tracking device they chose? Even if I don't go back to wearing a tracker in the future, I'm glad I used one for so long. My behavior has truly changed over time thanks to the Fitbit. Tell me: Do you wear a fitness tracker? Does the social part matter to you? Do you think it changes your behavior? I've got a Fitbit and, like you, was an early adopter of the technology. I'm definitely in a season where my priorities are changing - I put away my scale for a bit and am highly contemplating the Fitbit being the next thing to go. Interesting that you like the Jawbone a lot better. I was thinking I'd feel the same about any tracker, but maybe not. I didn't know it integrated with Strava. I was an early adopter of the FitBit, but largely forgot about it when the clip broke and I had no way to wear it anymore. Plus, mine never registered a single stair in the entire time I wore it. Then I got a Nike FuelBand about a year ago and it's been a much better fit for me given that a) I wear it on my wrist all the time, b) it syncs with the Nike Running app, and c) it syncs with the Nike Training Club app. I was disappointed when they announced they weren't going to be updating it anymore. Still, I'm a solitary exerciser, and I've never really used the social aspect of either the FitBit or the FuelBand, although I do enjoy the ability to do challenges with my sister through both the FuelBand and Nike Running. My original one didn't do stairs, but the new version did so I enjoyed that change. It's cool to know that you like a different one, I was thinking I'd feel the same about any tracker. I never purchased a fitness tracker. I do however, always wear my garmin when I run. I just bought the iPhone 6 and it has a built in tracker. I find myself opening the app to see my steps. It's funny how addicting it can be! Oh yes - not giving up the Garmin anytime soon! :) And yes, so addicting. I use Garmin and Strava, but lately am suffering from tracking fatigue. The only thing I care to measure occasionally are specific pieces of data, like Strava segments on a course or fast laps around the track, which I can do with a simple stopwatch. The only other data that may be useful to me is heart rate recovery time. I can see that - I still love my Garmin and Strava, but the additional layer of tracking on top of it didn't feel worth it anymore. I have never used a fitness tracker before, but I noticed on my iphone 6 there is a health app with tracking built in which is kind of cool. Fun to view your stats after a big run haha. Only tracking that I do is garmin watch on runs. Otherwise I don't use anything - just seems like way too much work to me. If I got a fitness tracker for free, I'd probably wear it, but I'd never pay for one. I think the technology is great, particularly for people who rarely move. For people like you and I, who are quite active on our own, it seems a little excessive. That's a great point. I bought them for my parents to encourage them to do more activity and that was part of the reason I kept using it for so long, because we could see each other's steps. My mom still feels like it's useful, but I feel like I'm getting the exercise anyway that it's not necessary.